…greater poverty than yours shall you see. the stars buried in our breast. in a space of delusions or wild frenzy. The wings of the Earth. in the night of the poets. like countries or broken like soldiers. We all suffer now are all worn. endlessly marching toward the front. …otros más pobres que vos veredes. de lo verde y del fuego. con los fieles azules del ozono. las alas de la Tierra. del sinsonte y el quetzal. ni se rompan como soldados. que nos acechan a todos. y marchan hacia el frente. 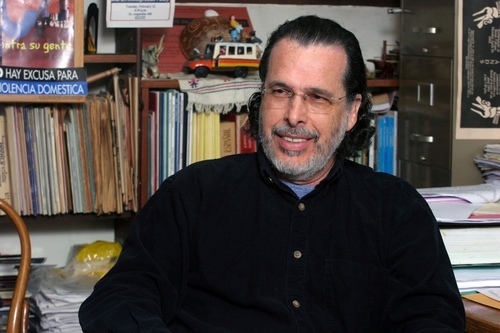 Enrique Sacerio-Garí is the Dorothy Nepper Marshall Professor of Hispanic and Hispanic-American Studies at Bryn Mawr College, where he has taught since 1977. He is known especially for his work on Jorge Luis Borges, and for his poetry. He introduced and edited a selection of Jorge Luis Borges’ early articles in the volume Textos cautivos, Ensayos y reseñas en El Hogar. His poetic works include: Comunión (a concrete poem) and Poemas interreales (Pennsylvania, 1981; Madrid, 1999; La Habana, 2004). His most recent book of poems is Para llegar a La Habana (Madrid, 2013). Suzanne Jill Levine’s acclaimed translations, which include books by Guillermo Cabrera Infante (Three Trapped Tigers) and Manuel Puig (Betrayed by Rita Hayworth), have helped introduce the world to some of the icons of contemporary Latin American literature. She is also an editor of Penguin Classics’ essays and poetry of Jorge Luis Borges and the author of The Subversive Scribe: Translating Latin American Fiction. She is the winner of PEN USA’s Translation Award 2012 for her translation of Jose Donoso’s The Lizard’s Tale.